Two boys were rescued from the Nature Preserve pond last week, after the ice they were playing on gave way and they fell into the water. Harpur’s Ferry and Vestal Volunteer Fire Department were notified to respond to the call around 1 p.m. on Saturday, Jan. 19, according to Binghamton University spokesman Ryan Yarosh. Officer Robert Meddleton of Binghamton’s New York State University Police was the first to arrive on the scene. The boys, whose ages are unknown, were about 150 feet from the southernmost edge of the land, and approximately 75 feet apart from one another, Yarosh said. Reports were unclear as to whether an attempt at using two floatation life-saving devices was successful. It is unknown how long the two were in the water. Both boys and a third boy who rescued himself did not suffer injuries, Yarosh said, but were still transported to an area hospital. The third boy had stripped out of his clothing and was able to get out of the pond on his own ‘ imitating a method he had seen on TV ‘ before emergency personnel arrived, said Vestal Department Fire Chief Douglas Rose. All three were treated and released, Rose said. 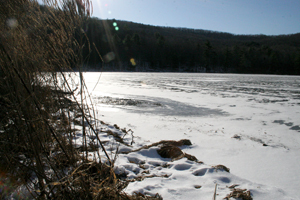 The Nature Preserve is open to the public, and Yarosh said there are usually signs posted asking people to stay off the ice and out of the water. Rose said that the incident seemed to be an isolated one, but emphasized the ‘dangers of ice,’ and said that even below-freezing temperatures are no guarantee that the ice is safe.